For the last four summers, I have photographed the support group Mother of an Angel Friendship Network. Martha founded the group after her teenage Donovan died in a distracted driving accident. 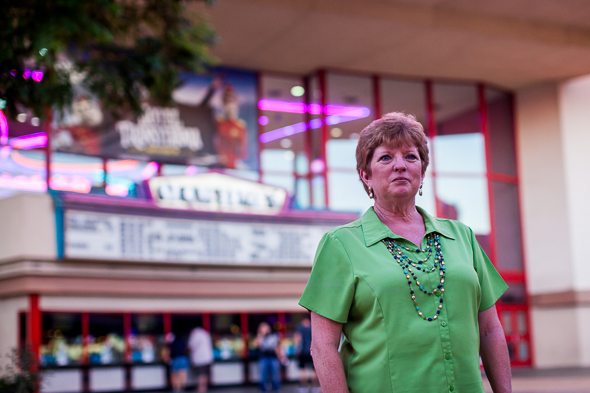 This year, I photographed Martha outside a Fresno, California movie theater. Since Donovan’s death, Martha has lead an extraordinary life. She has spoken across the country. She has appeared on national television. Yet there are still some things she will not do. Martha once loved escaping to the movies. Now, she struggles to stand near the marque. Today I arrived in San Antonio, Texas for the Fall 2012 National High School Journalism Convention. A few thousand high school students attend each national conference. I am one of the speakers. We challenge the students to engage their audience and exercise their First Amendment rights, but I wonder if the students trust us. Do I have the authority to reach the students. This entry was posted on Thursday, November 15th, 2012 at 5:55 pm. It is filed under Causes and Events, Mothers of Angels, Religion and tagged with Distracted Driving, Martha Tessmer, religion. You can follow any responses to this entry through the RSS 2.0 feed. I posted this today about Martha Tessmer. I am at a national convention with a few thousand high school students and educators and I want her message to reach a few more people (students and adults.) Every year on the JEA Listserv, teachers ask for guidance about how to deal with the loss of a student. Martha may help so that fewer people ask. Thank you, Bryan, for continuing to support the efforts of my family in trying to make Donovan’s legacy still touch hearts and save lives. With a collective effort, we can only hope that a young person who we’ve seen or spoken to will live out their full life on Earth because of our outreach. Don’t ever be concerned that you’ve done nothing when you have done so much to promote life-saving topics in a variety of ways. For those interested in better understanding not only the dangers but especially the consequences of distracted driving, have them visit the website http://whatslethal.com They can find Donovan’s story under ‘Videos’. Just seeing the look of pain on the faces of so many is enough to think and rethink the depth of tragedy when a young person loses their life in a preventable manner. Thank you for including the What’Lethal link. I have seen the video online and during your presentations. It is powerful. When the students saw it, they were changed. It was undeniable. Thank you for sharing this. I will help share the message. Thank you Janene. Martha is one of our local heroes. Part of her message is that she has learned from her suffering and she continues to keep going. She still hurts, but she hasn’t given up. She has a great family too. She and her husband were great parents and they are still great parents. i am sharing Martha’s message with my students and others. Thank you, Bryan. What a journey for both of you. I am so glad you both built a bridge to further education and communication about a topic that is so difficult. Blessings to you both. Thank you for encouraging me. You were one of the early supporters when I needed it. That was very special Bryan, and the photos are beautiful. I can’t believe we were all standing or sitting right near there while you took those. I remember seeing you take these photos, but what YOU actually saw and captured is amazing. Martha glows in these photos and I feel weird about having been a few feet away and not having seen that. Thanks for saving a moment I missed, so I could see it and appreciate it now. It’s huge. What a triumph for our girl. Thanks for sharing your life with me, especially the most vulnerable part. I would not be able to see without you and your group sharing. Throughout the years, I have become better at capturing the images and still telling your stories. The first year, we all learned together. Thank you. I appreciate these so much. I guess I’m speechless. Who would look at this middle aged woman walking the mall and know it’s how I feel connected to my son? It really makes you wonder what might be the reality of every person you pass…what they might be going through and what might be going through them. Thanks for caring about us Bryan. You are welcome. Thank you too. I receive much more than I give. And I am able to pass on lessons to others which also is a gift for me.